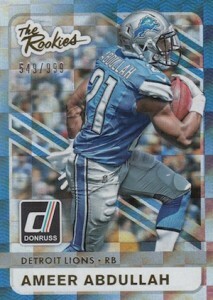 Returning to the gridiron for the first time in several years, 2015 Donruss Football features a retro design amid a sea of rookie and veteran faces. Hobby boxes average three hits per box. The 300-card base set in 2015 Donruss Football features several subsets, including Rated Rookies (1:6 packs) and Gridiron Legends. Multiple parallels are available for the base set, with numbering as low as one-of-one. 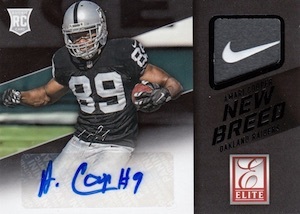 There are also plenty of autograph options in 2015 Donruss Football. Throwback Rookies Signatures (#/25 or less) are exclusive to Hobby boxes and honor the 1985 Donruss Baseball design with rookie autographs. One of the more celebrated signed inserts from the Donruss brand, Passing the Torch Autographs return with dual signatures and there are also memorabilia versions. New Breed Rookie Jersey Autographs covers some of the top 2015 NFL Draft names, including Marcus Mariota and Jameis Winston, with a jersey piece and signature combo. There are also premium New Breed autograph relic parallels. Other signed inserts include Elite Series Signatures, Signature Series and The Rookies Autographs. 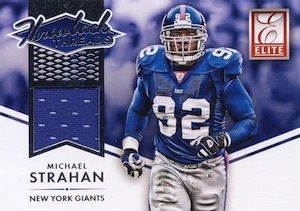 It would not be Donruss without several inserts and that tradition continues in 2015 Donruss Football. Options include familiar lines like Classics (1:24 packs), Dominator (1:24 packs), Elite Series (1:12 packs), Gridiron Kings (1:12 packs), Passing the Torch (1:12 packs) and The Rookies. 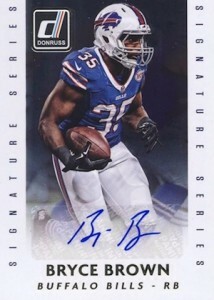 2015 Donruss Signature Series BRYCE BROWN Auto - Bills Eagles Kansas St.
View specific parallel print runs on the full spreadsheet. 40 cards. Serial numbered #/999. *Card #14 only found in parallels. 4 cards. View full details here. Are Gridiron Kings, Dominator, and Classics subsets or inserts? Some websites say they are subsets and others say inserts. Matt � I’m honestly not 100% sure. 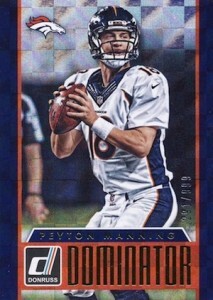 The information from Panini listed Classics and Gridiron Kings as both subsets and inserts. Dominator is an insert. It would make more sense for Classics and Gridiron Kings to be inserts right? Since you only get 2 a box. Matt � Probably. Unless they are treating them as SP base cards. Panini is definitely the worst about playing games with the “base” set. So I think I’ll just buy this in retail instead of hobby. I have a feeling it’ll be like 2014 Topps Chrome football which had everything like hobby and seemed to have better hits. Hoping this year is better than last year’s junk products that had no value at all. 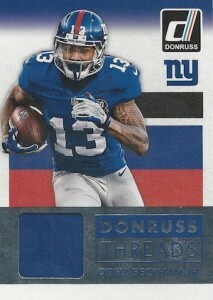 Do you know if Panini plans on pushing Donruss and Spectra back, since it is only 4 days from their scheduled release and there is no checklist for either. I love the retro feel of this product, however the autos I got in 3 boxes where horrible, I collect sets and certain players and hardly got a insert I wanted, but it was good product overall. Is there anywhere I can find information regarding the wrapper redemption mentioned in the checklist? Nice looking set, but as a set builder it’s horrible. Far too many SPs to complete the set. Just like UD MVP hockey, this is considered a low end set, therefore there won’t be enough opened to ever have a reasonable chance at tracking down all the SPs needed to build the set. I need 13 base cards and close to 80 SPs. It’s certainly not cost effective to plunk down $3-4 for each SP online. So this will go in a box somewhere, never to be completed, and I will not purchase anymore Donruss football products in the future as long as there are SPs in the base set. When will these companies learn that they are killing sales with all these SPs? I think that this is a sleeper to be a great set down the line. For lower end, it rocks. The cards are quality. Low defect rate, solid design, solid checklist and affordable. The first box I busted of this product was exciting. 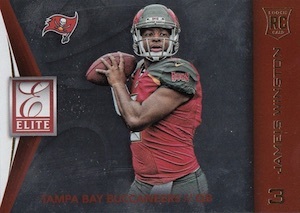 I hit three Jameis Winston RC cards, one base rated, one sub set, and one press proof numbered to #199. Also, in that box I hit a Kevin White Jersey/Auto numbered to #25, Amari Cooper Jersey, and two other press proof cards numbered to #25(Emmit Smith and Franco Harris). The second box, however, was very underwhelming. The auto/jersey combo was DeVante Parker, but it was not numbered. I got a TJ Yeldon Jersey card, but nothing really good in the press proof department. I got a dominator card in the second box, unlike the first, but I was unimpressed. It’s numbered to #999(DeMarco Murray), and it took me 48 packs to find one? I’ll probably end up blowing lots of money trying to put the set together like I’m still trying to do with 2015 Prestige Football due to all it’s short prints on rookies and other base cards. But, I’m determined to continue, and I would somewhat recommend this product based on the fact that I have busted one box in which I got more than I paid for. If your a set collector though, I would target another product. At first, I wasn’t going to collect this set, but went to a card show last Sunday and bought the set of four Wal-Mart redemption cards. Very nice looking! Went into Wal-Mart this morning and argued with myself about the set and going for another set of redemption cards and ended up buying 2 Retail Preferred boxes and I have to tell you, they cleaned up the visual of the pictures of the classic players in the set. 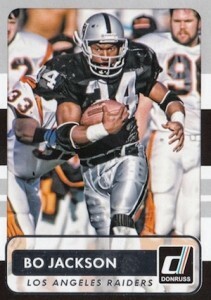 Bo Jackson, Joe Montana, and Namath plus others look like they’re current players today from the look of their cards. The “Elite” cards, I think, is where the value is. From those two boxes, I’m only 3 cards from a complete set of the 1-200 set, but the 201-300 is a different story, I’m 86 cards from the set on that. It reminds me of another Prestige set!!! However, I’m getting another 2 Wal-Mart redemption sets! The SP’s are killing products these days. I bought 12 boxes from Walmart since this product was released. I’m not even close to finishing the SP’s. If anybody has doubles lemme know and I’ll do the same. What I wish companies would do is insert info card about these wrapper redemptions. I didn’t know about it till I bought 8 boxes. Think I have receipts? NO!!! They put enough Kid Reporter info cards in. How about something for these types of things. Just a thought. No way I’m getting close to my $$ back as I never really hit anything in all 12 boxes. Pretty sad. 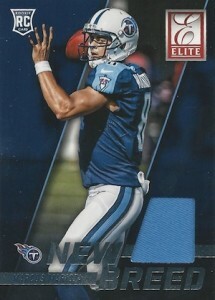 This is a real garbage product, with mediocre card design and horrible break-for-dollar value. I bought a case of this product and the best hit I got was a Johnny Manziel threads card. I paid a premium price for what turned out to be a very low-end product. I thought so highly of it that most of what came out of the case is now gracing my local landfill. dont underestimate this product its great and its a great option for someone wanting to get into breaking at a cheap price..
Any information if the passing the torch autos are hobby exclusive? 2015 Donruss Football Hobby Box - Factory Sealed! 2015 Panini NFL Donruss Factory Sealed Football Hobby Box Marcus Mariota RC ? ?